Background: Changes in salivary flow rate were studied in head and neck (H and N) cancer patients who, after receiving moderately accelerated radiotherapy (RT) and concurrent chemotherapy (CT), were free of disease at 1 year. Materials and Methods: Between July 2003 and July 2005, saliva estimation was performed for 36 patients of locally advanced (AJCC stages III and IV) squamous cell carcinoma of the H and N. RT, moderately accelerated (70Gy/35 fx/6 weeks) along with concurrent weekly cisplatin at 35 mg/m 2 (capped at 50 mg) with standard hydration and anti-emetic cover, was planned using conventional planning on telecobalt or 6 MV photons. The saliva flow rate was estimated for 5 min at rest (unstimulated) and after using lemon drops (stimulated) for the next 5 min at baseline (pre-treatment), 3, 6 and 12 months following treatment. Results: The median follow-up of this study was 29 months. Compared with baseline, by 3 months, a significant reduction in unstimulated (0.35 ml/min and 0.10 ml/min) and stimulated (0.97 ml/min and 0.28 ml/min) salivary flow rate was observed, respectively. 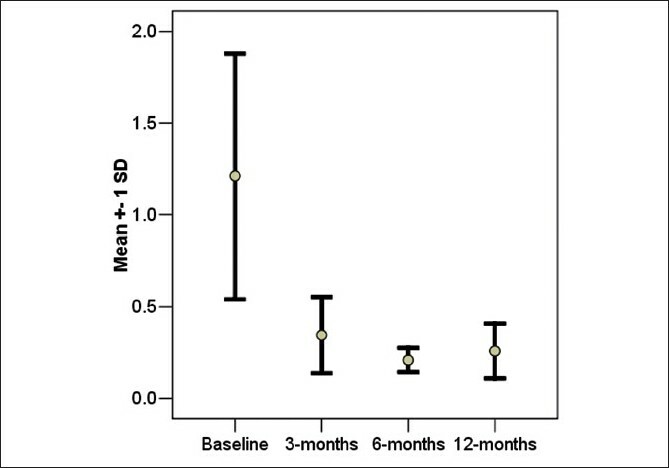 This continued to decrease further till 6 months (0.06 ml/min and 0.17 ml/min) and, by 12 months, a minimal and non-significant recovery was observed in both unstimulated (0.08 ml/min) and stimulated salivary flow rates (0.22 ml/min), respectively. Conclusions: Salivary flow rates fall to a fourth of the baseline value with the above CT + RT protocol, with minimal recovery at 12 months following completion of treatment. In this study, we attempted to quantify the salivary flow rate changes during the first year following concurrent chemoradiotherapy (CRT). 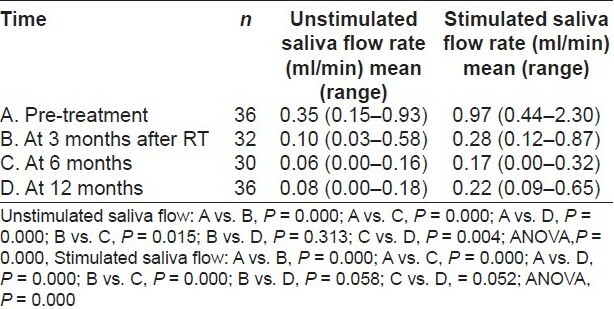 Salivary flow rates were estimated in a group of patients who were treated with a moderately accelerated CRT protocol using conventional RT techniques. 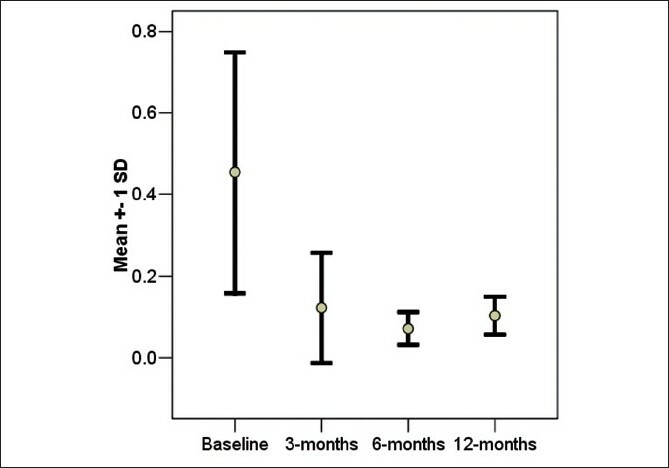 Previously untreated SCC of the H and N region belonging to AJCC stages III and IV were included in this study provided they had a minimum disease-free follow-up of 12 months. Those patients with distant metastasis, recurrent disease, second primary neoplasm and nasopharyngeal primaries at diagnosis were excluded. Standard evaluation protocols included a through history, general examination, an ear-nose-throat evaluation with direct laryngoscopy (as and when required), baseline hematology, biochemistry, chest X-ray PA view, a contrast-enhanced computed tomography scan (CECT) of the face and neck, dental prophylaxis and estimation of the glomerular filtration rate. RT planning consisted of simulation in the supine position preceded with fabrication of a thermoplastic H and N immobilization device. RT planning was done in a phased manner using a 3-field technique. In the 1 st phase, the primary and the draining lymph node regions were included in the target volume to a dose of 44Gy/22fx/4.5 weeks, treated 5 days in a week (Monday through Friday). An oral cavity shield using a block at the upper anterior edge of the lateral fields was placed wherever subclinical disease spread to this region was not anticipated. The lower anterior neck (LAN), including the bilateral supraclavicular fossae, was treated using a single anterior field with lung and spinal cord shielding as appropriate. A dose of 50Gy/25fx/5 weeks was delivered at a depth of 2 cm. In phase II, an off-cord reduction was performed, and the fields reduced to include the primary tumor and nodal drainage sites with a margin of 2-3 cm and a dose of 16Gy/8 fx/1.5 weeks was delivered. The boost was delivered as the 6 th fraction of the week on each Saturday from the 1 st week of treatment. It encompassed the primary tumor and enlarged nodes with a margin of 1 cm, and a dose of 10Gy over five fractions was given. Thus, the total planned dose was 70Gy in 35 fractions, to be completed in 6 weeks, which was delivered using telecobalt (Theratron 780-C, AECL, Canada) or from a 6 MV linear accelerator (CLINAC 600C; Varian Medical Systems, Paulo Alto, CA, USA). Patients received weekly doses of cisplatin (CDDP) at 35 mg/m 2 (capped at 50 mg). Chemotherapy (CT) was given with 2-3 L of hydration, mannitol diuresis and antiemetic cover consisting of ondasetron and dexamethasone. RT was synchronized with CDDP therapy and was delivered within 1 hr of administration of CDDP. All patients were hospitalized on the day of administration of CT. Patients were evaluated at weekly intervals during RT and at monthly intervals for 3 months and once in 2 months thereafter. Acute and late morbidity were recorded as per the RTOG/EORTC guidelines. Responses were scored both for primary and for nodal sites at 1 month following completion of treatment. During collection of saliva, patients were seated and asked to minimize orofacial movements and not to attempt to influence salivary flow (such as by sucking or swallowing). Just before the collection, the patients were instructed to allow saliva to accumulate in the floor of the mouth for 60 s without swallowing. The patients were instructed to then spit the accumulated saliva into a pre-weighted 50 ml vial. The patients were asked to repeat this procedure four more times for a total collection time of 5 min. Subjects were instructed not to swallow the saliva during the entire collection procedure. After the collection of unstimulated saliva, patients had fresh lemon juice applied with cotton-tipped applicators to the lateral tongue bilaterally five times over a 2-min period (0, 30, 60, 90 and 120 s). The mouth was then to be emptied of the retained lemon juice solution. Saliva was then collected for 5 min in the same manner as for unstimulated saliva. Patient, disease and treatment variables were summarized as means and standard deviations or as proportions or percentages. Statistical significance of differences in proportions was tested using the χ2 test while differences in means were tested using the t-test. Between July 2003 and July 2005, 36 patients with SCC of the oral cavity, oropharynx, larynx and hypopharynx, belonging to stages III and IV (AJCC 1997), with no evidence of disease at 12 months following RT, and with a minimum of baseline and 12-month saliva flow rate values, were included for this analysis. 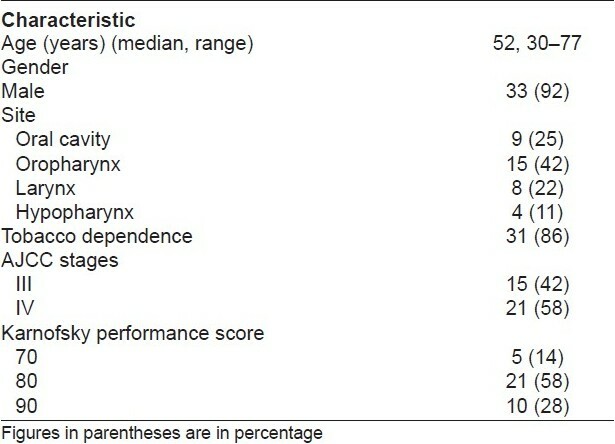 Patient and disease characteristics are detailed in [Table 1]. The median age was 52 years (range, 30-77 years); 33 (92%) were male; the primary site of disease was the oral cavity, oropharynx, larynx or the hypopharynx and 30 (83%) subjects were admitted to regular tobacco usage. 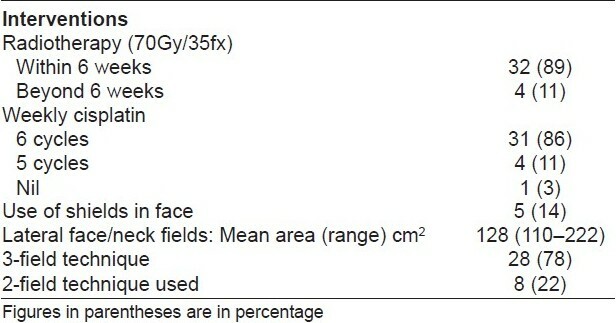 The treatment interventions and field sizes are detailed in [Table 2]. All but one patient received concurrent weekly cisplatin. The 3-field technique using lateral opposed face and neck fields and a low-anterior neck field was used in 28 (78%) of patients. The mean area of field size was 128 cm2. A 70% decrease in unstimulated and stimulated salivary flow rate at 3 months (P = 0.000, both for unstimulated and stimulated) was observed and these rates decreased further till 6 months (P = 0.015 and 0.000 for unstimulated and stimulated, respectively) after which a partial recovery in flow rates was seen by 12 months stimulated salivary flow rates before treatment and up to 12 months after completion of RT are shown in [Table 3] and [Figure 1] and [Figure 2]. These patients have a median follow-up of 29 months and, at the last follow-up, 21 (58%) were free of disease, eight (22%) had recurred and seven (20%) had succumbed to illness. The patient subset was chosen out of a phase II trial that tested a moderately accelerated course of concurrent CTRT and inclusion was based on patients who had measurements at least at base line and by 12 months and with no evidence of any locoregional or systemic recurrence. This trial design was based on our earlier experience and the reported evidence in the literature. ,,,, A sharp decline in unstimulated and stimulated saliva output was observed at 3 and 6 months following RT. This was followed by minimal recovery at 1 year. This study aimed to provide baseline (CTRT) data for comparison with the changes in salivary flow rate following introduction and implementation of a parotid-sparing intensity-modulated RT (IMRT) technique, currently being used in the department. The observations therefore do not segregate the impact of chemotherapy from radiotherapy. The magnitude of dryness is a function of volume of the parotid glands irradiated. Conventional fields usually encompass larger volumes of normal structures as compared with conformal RT, and leave the patient with a greater proportion of dryness, as also reported in our earlier trial (i.e., 78%). The conventional field sizes depend on the location of the tumor and its patterns of spread, i.e. the cranial field edge is placed higher in superiorly located tumors (or its CTV) and therefore a greater amount of parotid gland gets irradiated. In the present study, we observed that there was considerable variation in the field sizes due to different primary locations. Studies have also shown that there is considerable variability in size and position of the parotid gland among patients. We did not attempt a subset analysis as the resulting sample size would be small. Since 3-D treatment planning was not done, it was not possible to comment on the size and location of the parotid gland with respect to the treatment portal in the present cohort of patients. Although multivariate analysis have shown that radiation dose to the parotid gland is the sole predictive factor for xerostomia,  yet shielding blocks for the oral cavity were used along with the large-field conventional RT to spare minor salivary glands. Although minor salivary glands produce <10% of the total saliva volume, they contribute >70% of the total mucin. It is therefore presumed that their sparing may lead to a better perception of oral wetness by the patient. In the present subset chosen, blocks at the anterosuperior borders of the lateral fields were placed in only five of the 31 patients who had tumors placed posteriorly or inferiorly. The relevant endpoint is also the patients' perception of dryness, and one of the short comings of the present data is a lack of information on quality of life issues. Although the literature is replete with reports and experiences of different centers showing encouraging results in terms of effective parotid sparing (at least of the contralateral gland) with IMRT,  in resource-constrained environments such as in India, conventional RT is being practiced and continues to take centerstage in the radiotherapeutic armamentarium of the locally advanced H and N cancer burden. In this context, it is relevant to quantify parotid function with conventional RT, especially with concomitant CT + RT, as this is now offered in appropriately selected patients. CT when used along with RT has shown significantly more damage to salivary glands than with RT alone. Similarly, accelerated RT also demonstrates a greater degree of dryness as compared with conventional RT. Further, the issue of dryness is also linked to extensive tobacco chewing habit, submucous fibrosis, poor oral hygiene and poor baseline nutritional and hydration reserves. It is in this context that we believe that the impact of both concurrent CT and accelerated RT on salivary flow changes must be documented as a starting point with which to compare parotid-sparing IMRT using similar CT + RT schedules. This work was a part of a project funded by the Uttar Pradesh Council of Science and Technology (UPCST), Lucknow. 1. Braam PM, Roesink JM, Raaijmakers CP, Busschers WB, Terhaard CH. Quality of life and salivary output in patients with head and neck cancer five years after Radiotherapy. Radiat Oncol 2007;2:3. 2. Guyton AC. Secretory functions of the Alimentary tract. In: Guyton AC, Hall JE, editors. Textbook of medical physiology. 10 th ed. Philadelphia: W.B. Saunders Company; 1998. p. 740. 3. Cooper JS, Fu K, Marks J, Silverman S. Late effects of radiation therapy in the head and neck region. Int J Radiat Oncol Biol Phys 1995; 31:1141-64. 4. Leslie MD, Dische S. The early changes in salivary gland function during and after radiotherapy given for head and neck cancer. Radiother Oncol 1994; 30:26-32. 5. Franzen L, Funegard U, Ericson T, Henriksson R. Parotid gland function during and following radiotherapy of malignancies in head and neck: A consecutive study of salivary flow and patient discomfort. Eur J Cancer 1992; 28:457-62. 6. Eisbruch A, Ten Haken RK, Kim HM, Marsh LH, Ship JA. Dose, volume and function relationships in parotid salivary glands following conformal and intensity- modulated irradiation of head and neck cancer. Int J Radiat Oncol Biol Phys 1999; 45:577-87. 7. Cox JD, Stetz J, Pajak TF. Toxicity criteria of the Radiation Therapy Oncology Group (Cox RTOG) and the European Organization for Research and Treatment of Cancer (EORTC). Int J Radiat Oncol Biol Phys 1995;31:1341-6. 8. Kumar S, Pandey M, Lal P, Rastogi N, Maria Das KJ, Dimri K. Concomitant boost radiotherapy with concurrent weekly cisplatin in advanced head and neck cancers: A phase II trial. Radiother Oncol 2005;75:186-92. 9. Pignon JP, Bourhis J, Domenge C, Designe´ L, on behalf of the MACH-NC Collaborative Group. Chemotherapy added to loco regional treatment for head and neck squamous cell carcinoma: Three metaanalysis of updated individual data. Lancet 2000;355:949-55. 10. Fu KK, Pajak TF, Trotti A, Jones CU, Spencers SA, Phillips TL, et al. A radiation therapy oncology group (RTOG) phase III randomized study to compare hyper fractionation and two variants of accelerated fractionation to standard fractionation radiotherapy for head and neck squamous cell carcinomas: First report of RTOG 9003.Int J Radiat Oncol Biol Phys 2000;48:7-16. 11. Overgaard J, Hansen HS, Specht L, Overgaard M, Grau C, Anersen E. On behalf of the Danish Head and Neck Cancer Study Group. Five compared with six fractions per week of conventional radiotherapy of squamous cell carcinoma of head and neck: DAHANCA 6and7 randomised controlled trial. Lancet 2003;362:933-40. 12. Browman GP, Hodson DI, Mackenzie RJ, Bestic N, Zuraw L. Cancer Care Ontario Practice Guideline Initiative Head and Neck Cancer Disease Site Group. Choosing a concomitant chemotherapy and radiotherapy regimen for squamous cell head and neck cancer: A systematic review of the published literature with subgroup analysis. Head Neck 2001;23:579-89. 13. Eisbruch A, Kim MH, Terell JE, Marsh LH, Dawson LA, Ship JA. Xerostomia and its predictors following parotid-sparing irradiation of head-and- neck cancer. Int J Radiat Oncol Biol Phys 2001; 50:695-704. 14. Chao KS, Deasy JO, Markman J, Haynie J, Perez CA, Purdy JA, et al. A prospective study of salivary function sparing in patients with head and neck cancers receiving intensity-modulated or three-dimensional radiation therapy: Initial results. Int J Radiat Oncol Biol Phys 2001; 49:907-16. 15. Garden AS, Morrison WH, Rosenthal DI, Chao KS, Ang KK. Target coverage for head and neck cancers treated with IMRT: Review of clinical experiences. Semin Radiat Oncol 2004;14:103-9. 16. Chao KS, Majhail N, Huang CJ, Simpson JR, Perez CA, Haughey B, et al. Intensity-modulated radiation therapy reduces late salivary toxicity without compromising tumor control in patients with oropharyngeal carcinoma: A comparison with conventional techniques. Radiother Oncol 2001;61:275-80. 17. Roesink JM, Moerland MA, Battermann JJ, Hordijk GJ, Terhaard CH. Quantitative dose-volume response analysis of changes in parotid gland functions after radiotherapy in the head- and- neck region. Int J Radiat Oncol Biol Phys 2001;51:938-46. 18. Yun Li, Jeremy MS, Taylor MG, Randall K, Ten H, Eisbruch A. The impact of dose on parotid salivary recovery in head and neck cancer patients treated with radiation therapy. Int J Radiat Oncol Biol Phys 2007;67:660-8. 19. Roesink JM, Terhard CH, Moerland MA, Van lersel F, Battermann JJ. CT- based parotid gland location: Implications for preservation of parotid function. Radiother Oncol 2000;55:131-3. 20. Milne RW, Dawes C. The relative contributions of different salivary glands to the blood group activity of whole saliva in humans. Vox Sang 1973; 25:298-307. 21. Braam PM, Terhaard CH, Roesink JM, Raaijmakers CP. Intensity modulated radiotherapy significantly reduces xerostomia compared with conventional radiotherapy. Int J Radiat Oncol Biol Phys 2006; 66:975-80. 22. Denis F, Garaud P, Bardet E, Alfonsi M, Sire C, Germain T. Late toxicity results of the GORTEC 94-01 randomized trial comparing radiotherapy with concomitant radio chemotherapy for advanced-stage oropharynx carcinoma: Comparison of LENT/SOMA, RTOG/EORTC, and NCI-CTC scoring systems. Int J Radiat Oncol Biol Phys 2003;55:93-8. 23. Specht L. Oral complication in head and neck irradiation patient. Introduction and scope of problem. Support Care Cancer 2002; 10:36-9.